Career Indaba is the perfect event for students looking to take the next step in their education and professional development. Over the past 3 years our event has grown and developed into the leading careers and employment event in South Africa. 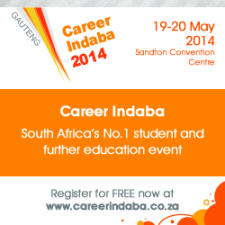 Career Indaba presents students with exciting and relevant careers and further education options in one location on the 19-20 May 2014 at the Sandton convention Centre. One of our key goals is to equip learners with the skills to go beyond the textbook and gain the practical knowledge to succeed in their lives after school. This year we have made huge strides into our international opportunities for learners by securing the attendance of universities from China, Russia and India. The universities exhibiting in the International Pavilions see Career Indaba as a valuable and unique opportunity to meet bright young South African students who could qualify for bursary places at their institutions. This is a first of its kind in South African careers events, and we want all students to be part of it. In addition free interactive workshops will be held on the expo floor which is designed to develop your skills and help you make the transition from high-school to higher education or employment. The workshops will be covering a variety of topics over the two days from CV Writing, perfecting your cover letter to getting advice about Career makeovers. Take the opportunity to gain practical and insightful knowledge. Meet employers, gap year providers, top universities and high profile corporates and realise your potential at Career Indaba this year.